In this time of Thanksgiving we give thanks to you for being a valued member of our Team Berkhout Bosse community of friends and clients. We are grateful for the opportunity of serving you and providing you with the best possible service, information and advice. 853 property sales processed through the Niagara MLS® system in September. This represents a 19.64% increase in sales over September of last year. 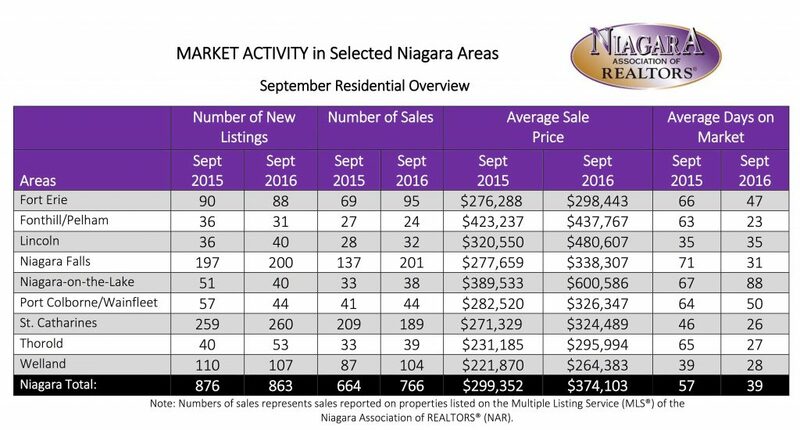 The Niagara residential average sale price of $349,113 was 25% higher than last September. The average days on the market decreased from 55 to 35. The chart below outlines residential market activity by market area. May you have a wonderful time this Thanksgiving, with friends and family. Hoping your celebration is filled with blessings and joy.